It is these shifts in the narrative, which allow for an analytic separation between the political ideology of Zionism and the theological ground in which it is embedded to be taken apart and then reconstructed, that are relatively new. New at least in the public domain which now opens to this discourse, though not new to the contributors to this volume who have been offering this critique for decades. Both the popular expansion of the field of human rights and international law to include insults and injuries previously left to examination as competing religious values, and the rise of “narratives” as a legitimate tool of critical analysis, contribute to these shifts. The volume is not a debate between adherents to opposite points of view, though the points of contention are clearly defined. Rather it is a collection of commentaries that arrive at a similar conclusion regarding the errors and costs of political Zionism. They dismiss the exceptionalism of the Zionist narrative, the dispensationalist rationalization of its Christian version, and the censorship (self and State supported) of the historical record regarding the intersection of Zionist ideology and political values of democracy, equality and justice. Because it is, in the end, a coherent perspective that presents a shared point of view, it lends itself to the attack leveled against it by advocates of the long successful repression of the human rights critique. The introduction and first two chapters, contributed by Walter T. Davis and Pauline Coffman, trace the political history of Zionism from Herzl (1890s) to the present, illustrating the bleeding of political and theological arguments to support the broad agenda of creating the State of Israel as a secular, conventional nation on the one hand, cloaked in a religious systematic when useful to its advocates. The next six chapters are examinations of Zionism from Jewish, Orthodox, Catholic, Protestant (Mainline, Evangelical and Christian Zionist) and Islamic perspectives. The last chapter, by Naim S. Ateek, root contributor to Palestinian Liberation Theology, ties the collection to the Kairos Palestine Statement which is included as an appendix. There is also an Afterword by Mark Braverman. In the broad context of debates on Truth and Relativism, Justice now takes an increasingly central place. Whatever the ultimate sources of such claims may prove at the end of time, it becomes clear in collections such as this that when the political program of secular actors appropriate the theological claims of communities of faith at increasing risk. That risk is that they will no longer be able to cloak themselves from criticism and judgment by doing so, but will rather find themselves subject to deeper scrutiny and challenge than in the past. The struggle for peace and justice, for the realization of God’s Kingdom on Earth, are making this generation of voices bold articulations of possibilities for human dignity once thought foreclosed by the powers and principalities. 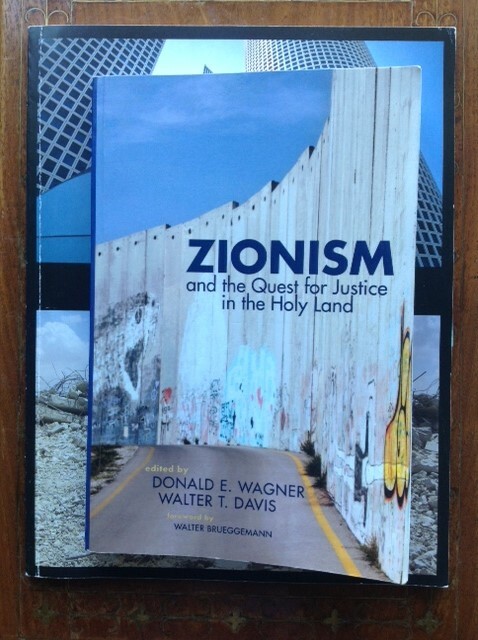 Zionism and the Quest for Justice in the Holy Land Edited by Donald T. Wagner and Walter T. Davis, Foreword by Walter Brueggemann and Afterword by Mark Braverman. Pickwick Publications, Wipf and Stock, Eugene, OR 2014 pp. 250.